Everything you need to know about the upcoming Season 1 Battle Pass. Our Apex Legends Battle Pass guide contains everything we know about the premium system, with Season 1 updates to come. Apex Legends is a free to play battle royale game, and given those circumstances it's no surprise to learn that the developers intend to monetise it primarily through the use of a Battle Pass. If you've played much of Fortnite over the 12 months, you'll be very familiar with the concept here. For those of you who have somehow missed that craze but are deep in Apex Legends, a Battle Pass is a way of working through objectives in order to unlock new shiny cosmetic rewards that are exclusive to the seasonal pass. There's an upfront cost, of course, but you have a very addictive roadmap of tasks and challenges to work through as you reach new reward tiers. Even if you are familiar with this sort of thing, we thought it would be useful to put together a Battle Pass guide for Apex Legends which covers everything that's been confirmed so far. As more details emerge, we'll add it in here with a future update. Apex Legends' first Battle Pass is now live! It costs 950 Apex Coins which equates to around £9 and it'll grant you access to over 100 tiers of cosmetic unlocks. This includes skins, quips, and the like. If you found the video helpful, do consider subscribing to his channel. After an endless slew of leaks and datamines, Respawn has finally - and officially - announced it's upcoming Battle Pass. First off, it's arriving today (or tonight) depending on wherever you are in the world. It'll be going live at 10:00AM PT, which translates to 13:00PM ET and 17:00PM GMT for those of us in the UK. More additional details have been revealed over on EA's Apex Legends page too. We know that Season 1 is called "Wild Frontier" and it'll work in a similar fashion to the likes of Fortnite's Battle Pass. There will be over 100 unique items to earn, and the more you play and level up, the more you'll earn. Expect everything from new weapon and hero skins, to EXP boosters and the like. The Battle Pass will be available for purchase at 950 Apex Coins, which roughly equates to around £9. There's also the Battle Pass Bundle available for 2,800 Apex Coins which nabs you the Battle Pass and also unlocks your next 25 levels for Season 1 instantly. Those who purchase the Battle Pass will instantly unlock the Lifeline Revolutionary skin, the Wraith Survivor skin, and the Mirage Outlaw skin. Finally, there are rewards for those who don't purchase the Battle Pass in Season 1. Everyone who plays the game will be able to earn 1 Wild Frontier Legend Skin, 5 Apex Packs and 18 Wild Frontier Stat Trackers. Respawn recently unveiled it's first major patch for Apex Legends, which not only included a few tweaks to weapons and Legends, but also shared details on its plans for Season 1. For a complete overview of all the changes introduced in the latest patch, as well as Respawn's philosophy on future updates, make sure you head on over to our news post which contains everything you need to know. It's also worth noting that changes we've listed above aren't completely set in stone. We imagine further refinements will be made once Season 1 gets underway and loads of new patches will iron out issues with current meta, bugs and the like. Release Date: Season 1's Battle Pass will be going live at 10:00AM PT on Tuesday 19th March 2019. Season Length: Seasons are planned to last for approximately three months, giving invested players plenty of time to maximise their rewards from the game. 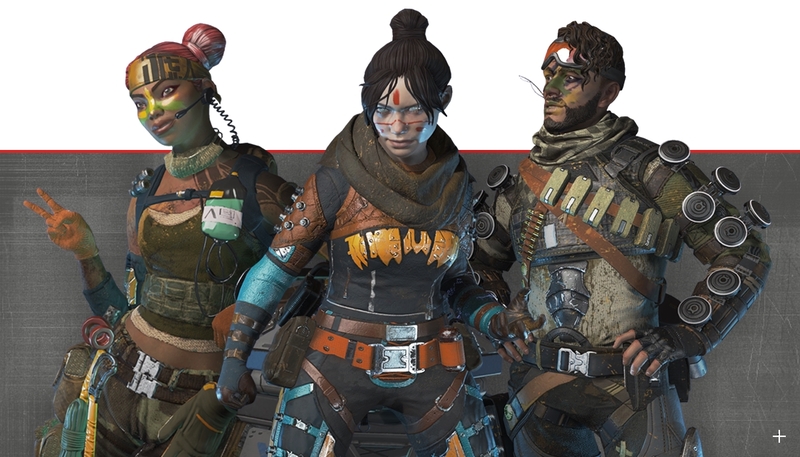 Cosmetic Rewards: Rewards obtained from the Apex Legends Battle Pass will be cosmetic only. You will not be able to gain any competitive advantage from working through the season. It's expected that there will be around 100 items to unlock in each Battle Pass. Legends: You will not be able to unlock new playable Legends by using the Battle Pass. This is in keeping with the philosophy about restricting the pass to cosmetic items only. Apex Packs: You will be able to earn more Apex Packs by participating in the Battle Pass programme. These contain items such as new weapon and character skins, banner cosmetics, and player emotes. Off-Season: Certain items you don't manage to acquire during a Season will be available to pick up even after the current Battle Pass has expired. 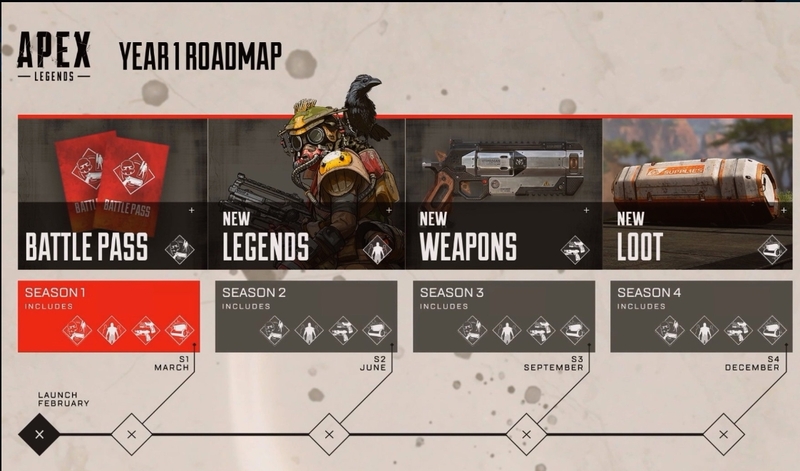 Below we've linked an image of Year 1 roadmap for Apex Legends and it's clear that Respawn has a lot planned for us. There are a total of four seasons in a year, meaning four different battle passes too. Each season will introduce new legends, new weapons, new loot and a battle pass rewards. The seasons will last around three months each, spanning from March all the way to December. Season 1 runs through March to June. Season 2 starts from June and runs to September. Season 3 kicks off in September and runs to December. Season 4 begins in December and will run through to March. You can only purchase the Apex Legends Battle Pass through the in-game store using Apex Coins, which you'll need to buy with real world currency. Launch Apex Legends, navigate to the Battle Pass tab, and purchase the Battle Pass from there. I bought my Battle Pass late in the Season, does this matter? You'll receive all the rewards up to your Battle Pass level retroactively. For example, if you've reached level 20 without the Battle Pass, upon purchasing it, you'll unlock all the rewards up to level 20! What happens once the Season ends? You won't be able to earn any more rewards once a season comes to a close, or until a new season begins. You do get to keep every Battle Pass reward you've unlocked after the season is over, though! Details of the format and rewards for Season One of Apex Legends have not yet been revealed by Respawn. As soon as they are though, we'll flesh out all the details in this section of our guide to help you get all those goodies unlocked nice and quickly! Let's take a look at other games like Fortnite and PUBG's Battle Pass systems and speculate as to how they could be implemented in Apex Legends. Fortnite and PUBG's Battle Passes cost around £8, so it's likely Apex Legends' Battle Pass will be pricely similarly. Although, we'd be prepared to pay a little extra (roughly £10) if we were to get some added extras. We're expecting there to be around 100 tiers, and as you play the game, you'll earn EXP towards levelling up and unlocking these tiers. Behind each tier, there will likely be a cosmetic reward. Think exclusive weapon skins, character outfits and potentially even more. We'd also expect there to be Legend Tokens, Crafting Materials and even Apex Coins behind each tier. Fortnite offers V-Buck bundles behind it's tiers, so there's no reason why Apex Legends can't follow suit. We're not sure if Apex Legends will feature Weekly or Daily Challenges like Fortnite. Fortnite will have you dancing in front of random points of interest across the map, and we just can't see this happening in Apex. However, we can see challenges like, "Kill 5 enemies with an SMG" as a potential task which would reward you with EXP towards levelling up your pass. PUBG doesn't do this, but Fortnite's seasons are characterised by significant map changes and themed content drops. For sure, Apex Legends will have season themed content drops and rewards to earn, but we doubt they'll be tied to the Battle Pass (there may be exclusive rewards for Battle Pass owners, though). Instead, new seasons could be marked by new maps, new legends and weapons.